Save energy with a canvas canopy or awning from Acme Awning Co., Inc. in Bronx, New York. By protecting your windows and doors from the sun, our canvas awnings lower interior room temperatures by an average of 8 to 15 degrees, increasing your comfort and reducing your cooling costs. Since 1921, we have been standing behind our Product with a 1 year guarantee on everything we install. 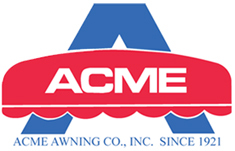 This 90 year policy of excellence gives our customers peace of mind knowing that Acme Awning Co., Inc. will be there to service their Awning and Canopy for years to come. Contact us for more information about our Residential Awnings and Canopies..